The Yintai Center (北京银泰中心) and Complex found at Guomao in the Central Business District (CBD) of the Chaoyang District of Beijing. It is one of the latest modern archeological landmarks found along the main boulevard of Jianguomen (Gate) Outer Street which is situated in the southern zone of the Central Business District of Chaoyang. 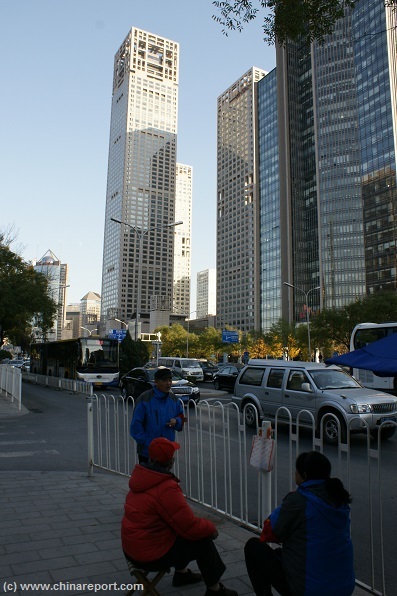 At the moment the highest tower of Yintai Center is the highest skyscraper to be found along Jianguomen Outer Street and in fact the entire extension of Eternal Peace Avenue (Chang An Jie) which is counted as the longest boulevard in Asia to date. Apart from its 249.9-meter 66 story counting highest tower, which can be clearly seen from along Jianguomen Outer Street and a large part of the southern CBD zone, the Yintai Center counts a large number of additional towers, all built along the same design and theme, neatly arranged into a larger complex and visual art piece. 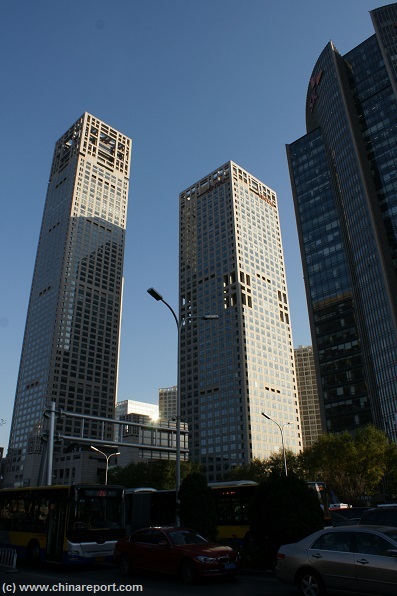 Apart from being a notable landmark with its highest building and its interestingly shaped three highest towers, the Yintai Center is also considered notable since it was the only privately financed construction project among the total of 66 ongoing at the time in the Central Business District (period 2011 - 2014). Today the Yintai Complex is a mixed purpose commercial housing complex which among things includes Hotels, Office Spaces, serviced apartments and shopping malls and more. The East Tower is also identified as the PICC Office Tower as one can also tell by the logo affixed the top of the building. Its counterpart, the West Tower is known as the Yintai Office Tower. A ground level view of the main Plaza within the Yintai Complex, which is one of the most visually interesting squares and spaces within the southern CBD. Have a walk around the buildings to fully appreciate the composition of square cubes and towers arranged into an art piece. The main towers of the Yintai Center and Complex overlook the wide main boulevard of Jianguomen Outer Street enriching the skyline along this popular strip in the southern CND. Almost adjacent stand the LG Twin Towers and further up north one can admire the World Trade Center Tower and the peculiarly shaped China Central Television (CCTV) Headquarters building. 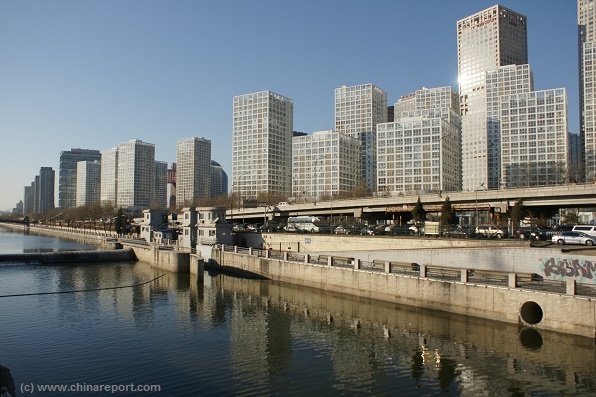 Built on the strategic location of the earlier mentioned Golden Cross, the many towers and buildings of the Yintai Complex sit immediately adjacent the west side of Guomao Bridge which forms the intersection of Jianguomen Outer Street and the 3rd Ring Road. As such the Complex stands virtually on top of the Guomao Subway Station and can be reached directly via its south western exit. Thus, although the center is reachable by use of various modes of transportation, the most convenient way to reach the Yintai Complex is via the subway / metro underground train system. Additional methods of transport are by taxi, or if must be by bus via the long and congested Jianguomen Outer Street or the 3rd Ring Road. The design for the Yintai Complex was done in the years 2001 and 2002 by the Architectural design bureau of John Portman & Associates Inc. All structures were completed in the year 2007, well in advance of the then much anticipated Beijing 2008 Summer Olympic Games. As mentioned, the Yintai Center has three central towers around which the other blocks have been arranged. Of the three central towers, the 66 storey central tower measuring 249.9 meters is flanked on each side by two symmetrical 52-storey, 186 meter tall superior office towers. Local Street vendors along Jianguomen Outer Street take a break to come together for a chat and a game of cards in view of the Yintai Center. Meanwhile traffic rushes in bother directions along the busy main thoroughfare of Jianguomen Outer Street. known as the "Golden Cross" in the southern CBD. Those living in the Penthouses have a magnificent view of the Golden Lights of Jianguomen Outer Street and the crossing with the ever busy and usually congested third ring road. In addition they have a prime view of the China Exhibition Center, the China World Trade Center Tower and often the CCTV Headquarters, all landmarks considered to rank among the best of the modern marvels of the Beijing Skyline. In total the Yintai complex counts some 360,000 square meters in overall floorage, 1600 parking spaces and has at least 11 towers making it one of the more extensive and visually interesting complexes in the city today. Although at first glance the highrises appear to be just fully modern, when one takes a further look one will find that indeed the towers and complex subtily integrate Chinese or Asian styled features, which are "hidden" away in the larger overall design. 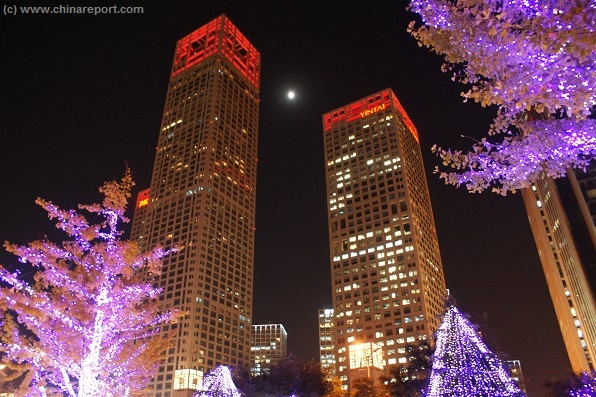 A point in case, during the evening and night hours the top parts of the three highest towers will be illuminated in a soft orange-red tone, making the tops of the Yintai Towers appear like traditional red Chinese Lanterns, albeit in a very modern and neatly stylized way. Other hidden design features only become clear when viewing the buildings at a closer range. To fully appreciate the various aspects of the complex one must venture about, both underneath the towers and at a due respectful distance. While wondering about, visitors will make various discoveries finally appreciating the full intracacies of the structural designs and their inter-action with the lineair world created around the towers of the complex. It all makes for an interesting journey of discovery and exploration in the southern Central Business District of Chaoyang in Beijing. To the south of the Guomao Station is a large hub for bus transportation with a multitude of directions and destinations to choose from. That said, few of the regulars at the Park Hyatt Hotel and the accompanying office towers will be found to make use of the bus lines. Only the ordinary staff who service the building, complex and visitors and inhabitants do however. Every morning, afternoon and night there is a rush hour at the subway station when the shifts are passed. For subway directions to Guomao Station, please refer to adjacent updated Map of the subway system as currently available. 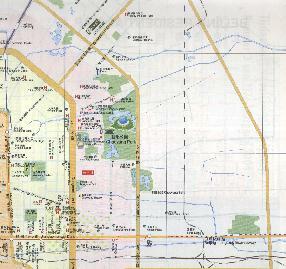 As one may view from the map of the current Beijing subway system, the Guomao Station is a part of the eastern section of the Red Line 1, which happens to be the oldest subway line in the city. Thoroughly modernized and upgraded it now serves the Golden Cross and continues well beyond by now extending as far as Tuqiao Station near the outer border of the far eastern outer suburbs. Views of the Yintai Complex buildings from various points at the Golden Cross a.k.a. Guomao Bridge in December of 2014. Standing together and seen from below the three towers seem to resemble the three legs of a tripod, which of course is one of the ancient forms usually found among the bronze cast grave ornaments and ceremonial tools of the graves of early feudal Chinese and Central Asian Dynasties. First coming into Beijing as a Chinese Design during the Shang Dynasty Era (1766 BC - 1121 BC), the tripod served as an important ritual tool (and also vessel) which symbolized Rank and Power right up to the Mongolian born Yuan Dynasty (1271 AD - 1368 AD). As such, the choice for this element in this design ties the hopes for a modern and magnificent future of the current day China to the long legacy of a (supposedly) glorious and rich past, both in cultural and financial terms. Continuing with the architectural design specifics of the Yintai Center Towers, the three square towers further resemble the Chinese character "品" (pin) when seen from above, i.e. in bird's eye view. Although this is impossible to notice this without taking a (so far rare) helicopter ride over the CBD or perhaps launching a drone, one may imagine how as seen from the sky the towers spell the Chinese character Pin, which according to the designers is best translated into the English language as meaning'quality'. the designer. The spelling of Chinese characters has an important function in the developed theories of Feng Shui (Geomancy), which are so hidden and integrated within the design. Similar arrangements may be found within the former Imperial Palace (the Forbidden City) where, for instance, the Imperial Gardens (Yuhuan Yuan) are dotted with pavilions designed to resemble various auspicious Chinese characters. Again, the designer makes of use of the golden features of the ancient traditions to draw an imaginery line between the Chinese historical and cultural past and the future, which has started already at the Yintai Center and surrounding Central Business District. designs as well as reach the desired esthetic effects. has been dubbed "a podium". Most of the podium area is taken up by the Park Hyatt Center which is made up of various high class facilities to ammend the luxury lives of the majority of the inhabitants of the towers and the Park Hyatt Hotel and apartments. For those who are interested in some luxury shopping, these include numerous high-end luxury boutiques among which in in-house Gucci Store. For those obliged to attend for work and business it may be useful to note that the podium also holds the conference halls and banquet facilities. Among these are several exquisite Chinese and Western restaurants. In addition there are the nearly obligatory modern fitness centre, a health spa plus pool, a medical clinic (hospital) and no doubt several other luxury facilities which we may have overlooked on our brief tour of the large complex. rather stunning and flawless. Naturally one must visit to see it and believe it. Of much more interest to the average visitor is the fact that the Sky Lobby boasts a splendid view of the southern CBD. Not only can one see the various nearby wonders of the World Trade Center Tower and the nearby CCTV Headquarters, the Sky Lobby is the place to best have a splendid close up view of the "Chinese lantern" of the main tower lighting up sky over the southern CBD. Although reservations are hard to come by, especially on short notice, one may well think about making an early reservation there and making a visit to the Sky Lobby and the unusual view a part of your exclusive tour of the now thoroughly modern city of Beijing. Enter the podium section connecting the three main towers to find shopping malls, the fitness center, the conference halls and all main facilities. The Hyatt Hotel sits in the main tower while luxury serviced apartments are spaced around the three towers. In addition to the Feng Shui inspired meanings entwined with the architectural design of the Yintai Centre, it may be noted that the Yintai logo is inspired by the two-dimensional shape of the "Chinese Lantern" structure crowns at the top of the central tower. Alike the tops of the towers, the Yintai Logo is square, simple yet bold and powerful. As the design bureau and its Chinese backers will have it; "Regarded as elegant, unique and vivid, this lantern-shaped logo represents the light seen and to be seen". As with the building design itself, the Yintai Logo has not been thrown together accidentally but is an expression of deeper meanings and thoughts. It is not only intended as a symbol of the Chinese history and culture, but also so as to make the Yintai Towers "the lighthouse illuminating the bright future of Beijing". Apart from the above, the designers have noted that the logo is also inspired by the window lattice used in Chinese traditional culture. The square window lattice looks like a cube, from which the image of a Chinese lantern is abstracted. The cube is also the main structural feature of all buildings that are part of the complex as can be clearly seen when circling around the Yintai Center. As for apreciating the full scope of the Yintai Complex one is well advised to walk down to the Tonghui River from where one is allowed a better view of all buidlings set together. As visible on adjacent photo the complex extends well westward from the main three towers. The Red Chinese Lanterns of the three Yintai Towers seen at their very best. The various towers and blocks of the Yintai Center from the Tonghui River (former Grand Canal) which lies to the south of Guomao extending west to east. Views of the Red Chinese Lanterns and Towers of the Yintai Center from various points in- and around the southern Central Business District. When done browsing the Yintai Complex and in the mood for more modern architecture to see one has plenty of options for a continuance. The most interesting directions to venture in are; north and west, whereas a hike southward will give one an opportunity to enjoy the view of the south Chaoyang Skyline which has undergone a remarkable change in the last 10 to 15 years, from the Tonghui River. 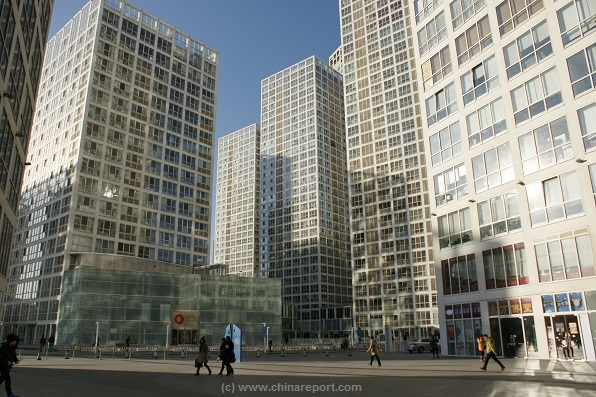 As an alternative, one may walk westward along Jianguomen Outer Street to visit various nearby towers and complexes. Among these are the LG Twin Towers - stunningly illuminated in the evenings and night, the ever popular shopping destination and miniature architectural landmark of the Silk Alley / Silk Street shopping Mall and the architecturally far less interesting IFC building. star restaurant and its top floor with scenic view, currently prices of available apartments range between 23000 Yuan and 58000 yuan per month for apartments that range in size from a 133 square meter 1 bedroom apartment to a 320 square meter 3 bedroom apartment. As such, the Yintai is not a place of housing for the average Joe of Beijing but rather of the happy few, often international executives of large multinational companies, Chinese economic giants and all those who hover around them providing various their services, know-how and facilities. Anyone touring the area by chance, as tourist or business traveler, may definitely take some good advice and head over to Yintai Center to have a closer look and experience the ultra-modern side of life in Beijing. it stand the Kerry Center and WTC Tower 3, the giant office tower that can be seen hovering over all of the Central Business District. To date the WTC Tower is the tallest structure in the city of Beijing entire. Tourist and anyone else interested may rise by elevator to the highest floors to have a look about the CBD and view around, that is - if the air conditions of the day allow for it. 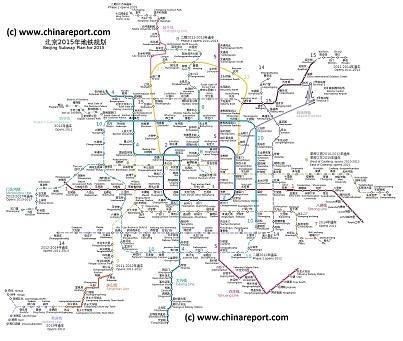 Among things, one can easily reach Jianguomen Station, the closest connecting station in the west from Capital International Airport by making use of the Airport Express train and making a short hop on the circular Line 2 (Blue Line). Either by taxi or by use of train and subway travel time between Capital Airport and Yintai Complex is about 30 minutes. With favors at the moment going for the subway option because of delays getting a taxi cab at rush hours at the Airport as well as the ongoing congestion problems on the third ring road leading down to Yintai Center. 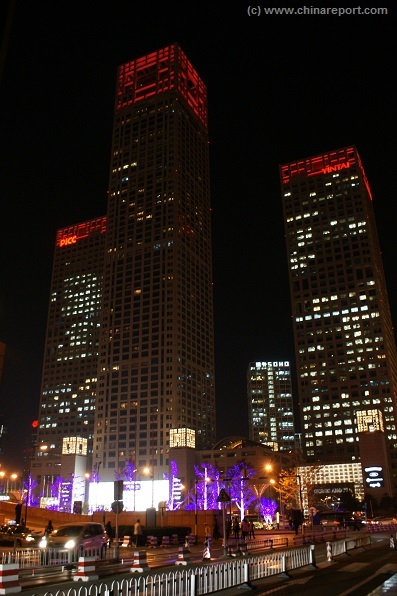 The Yintai Complex stands at Jianguomen Outer Street No.2 which is east adjacent of the LG Twin Towers. The Complex can be seen from Jianguomen Outer Street and stands across from- and to the south of China World Exhibition Center and Hotel. 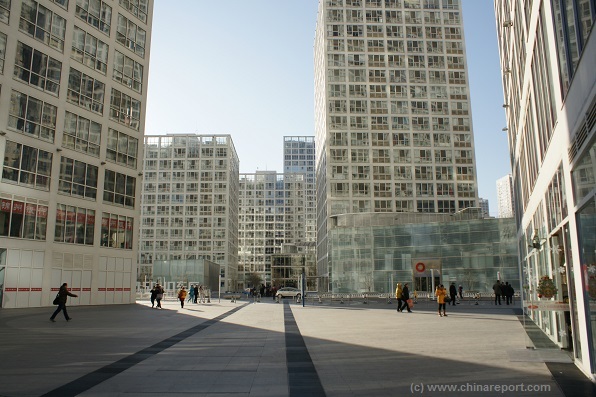 It is just a short walk from Guomao Station south west exit to the various buildings that make up the Yintai Complex. Those making use of a Taxxi cab or arriving by means of their own car or other transportation can drive right up to the Yintai Center, either making use of the 3rd Ring Road or via Jianguomen Outer Street. 1600 Parking spaces are available to take care of your ride while your away on business or leisure. be a tourist attraction. One may discretely try and dwell around the plaza's and inner public spaces which have some more surprises.